Previews. Hasbro has a new Autobot Smokescreen action figure coming out later this year. 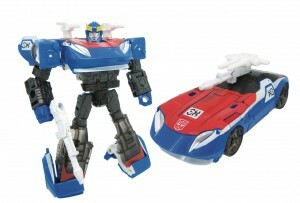 WFC-GS06 Smokescreen will be part of the collector oriented Generations Selects line. Here's the information from Previews about this exciting new reveal. From Hasbro Toy Group. This special edition Generations Selects WFC-GS06 Smokescreen figure portrays the classic G1 character with a G1-accurate head sculpt. Figure converts to a Cybertronian alt mode in 14 steps, deco'd to reveal how Smokescreen would have looked on Cybertron. The deco incorporates Cybertronian numbers into his classic exterior. With this Smokescreen figure, fans can add to their Praxus-native collection. Smokescreen joins Barricade and Prowl (each sold separately, subject to availability) as the third Praxian character designed in his native Cybertronian form. The Smokescreen figure comes equipped with a W-45 Acid Pellet Blaster accessory and 2 W-50 Volt-Beam Cannon accessories that can mount on his shoulders or the hood of his vehicle mode. TOTALLY RADICAL AND SUPER COOL AWESOME AND I CAN'T WAIT TO GET HIM!!!! And also hope Bluestreak is a real thing too! Good. Now all we need is Bluestreak. This mediocre mold looks like he's leaning forward on his tip toes. Looks great but I think the most interesting thing about it is the number. Megatron was GS01 and this is GS06 so that means there's at least another 3 selects figures in the pipeline besides Redwing. Actually doesn't the numbering only point out to two more figures? Ricochet and Red Swoop will fill in there somewhere. ZeroWolf wrote: Actually doesn't the numbering only point out to two more figures? Ricochet and Red Swoop will fill in there somewhere. I don't think so, those two don't seem to be numbered much like Star convoy. Can't say to like it very much. Prowl wasn't bad, but this and Barricade aren't that hot unfortunately (IMHO, obviously). Moonlit Stones wrote: Good. Now all we need is Bluestreak. steals_your_goats wrote: Megatron was GS01 and this is GS06 so that means there's at least another 3 selects figures in the pipeline besides Redwing. So they're all from Praxis, now? Shame redwing took a slot as those 35th anniversary figures would have fit in quite nicely given they are War for Cybertron molds to boot. Red Wing hasn't been formally announced, but the name-drop in Combat Megatron's originally listing tentatively confirms that he'll have a spot in the WFC range. The 35th Anniversary range may have been green-lit rather late, after the first 6 WFC Selects were decided upon. Soundblaster having a retooled door is interesting, more than likely it's a gang-molded part. But the GS in the numbers is for Generations Select so it makes more sense for the figures without numbers to have "invisible" numbers, but still be part of the count. Since Star Convoy is a Takara Tomy initiated figure he might lack a number, but still count as part of Hasbro's system. Swoop and Ricochet were announced before Megatron so it's possible they came up with the numbers later and it was too late to add them in. The numbers do match the release dates. If Red Wing is real and numbered GS04 with a mid-Summer release and no other figures are announced with numbers in between Megatron and Smokescreen we'll know the other three are part of the numbering system. Siege Smokescreen looks pretty good here, but of course, I have some deco nitpicks! First of all, there's a bit too much blue on the car hood/robot chest compared to red, but it's acceptable. A little blue paint on the biceps would be nice too, but again, it's a small detail that doesn't make or break the figure for me. What I would have really appreciated, though, would have been white thighs. All that black plastic just kind of makes the whole middle of the figure look too "washed out," hiding much of the sculpting detail. This was the case on Siege Prowl too, but he at least had some yellow paint apps on the pelvis to break things up. Smokescreen doesn't have that, so having white thighs would have helped make the deco feel that much more "complete." I like your valid points Wolfman...it definitely would have improved him even more! But I am a bit disappointed with you / ....if you could give Smokescreen his shoulder weapons why not with Prowl....well? 4,835 pages were recently viewed by 1,114 unique visitors. This page was viewed 2 times on Saturday, April 20th 2019 9:18am CDT. © 2019 Seibertron, Inc. DBA Seibertron.com. All Rights Reserved. Established June 2000. Seibertron.com is owned by Ryan Yzquierdo.